This is the 2018 schedule for the West Michigan Ironmen. The Ironmen join the Indoor Football League for 2018. It will be the third league in its three-year existence, having played in American Indoor Football in 2016 and Champions Indoor Football in 2017. They finished the their 2017 CIF season at 4-12, failing to make the playoffs. They are the eastern-most IFL team, located In Muskegon, Michigan on the east shore of Lake Michigan. West Michigan is coached by Tyrese Lynk and play their home games at L.C. Walker Arena in Muskegon. The Ironmen open their first IFL season with two road games, Feb. 25 at the Green Bay Blizzard and on March 2 at the Cedar Rapids Titans. In all, they will play four of their first five games on the road. They have a pair of two-game home stands leading up to the season finale when they visit the Iowa Barnstormers on June 16. West Michigan will play six home games and eight road games in 2018. Each IFL team has three bye weeks over the course of the season. The Ironmen's byes come in weeks 6, 8 and 14. The Indoor Football League released its schedule on November 14. The league is entering its 10th season of existence. All Ironmen games will be broadcast locally on the radio and will be available for streaming through those stations. SCtoC will provide links in its previews in previews of the games. All IFL games are available to be streamed on video via the IFL's YouTube channel. Below is the Ironmen's 2018 schedule. Times and dates are subject to change. All times are pacific. 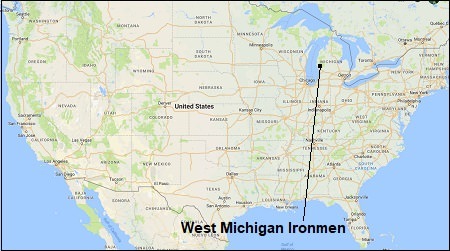 Week 1 -- Sun., February 25 - West Michigan Ironmen at Green Bay Blizzard, 1:05 p.m.
Week 2 -- Fri., March 2 -West Michigan Ironmen at Cedar Rapids Titans, 5:05 p.m.
Week 3 -- Fri., March 9 - Cedar Rapids Titans at West Michigan Ironmen, 4:15 p.m.
Week 4 -- Fri., March 16 - West Michigan Ironmen at Bloomington Edge, 5:05 p.m.
Week 5 -- Sat., March 24 - West Michigan Ironmen at Nebraska Danger, 5 p.m.
Week 7 -- Sat., April 7 - Green Bay Blizzard at West Michigan Ironmen, 4:15 p.m.
Week 9 -- Sat., April 21 - Iowa Barnstormers at West Michigan Ironmen, 4:15 p.m.
Week 10 -- Sat., April 28 - West Michigan Ironmen at Arizona Rattlers, 6:05 p.m.
Week 11 -- Sat., May 5 - West Michigan Ironmen at Sioux Falls Storm, 5:05 p.m.
Week 12 -- Sat., May 12 - Nebraska Danger at West Michigan Ironmen, 4:15 p.m.
Week 13 -- Sun., May 20 - West Michigan Ironmen at Arizona Rattlers, 3:05 p.m.
Week 15 -- Sat., June 2 - Sioux Falls Storm at West Michigan Ironmen, 4:15 p.m.
Week 16 -- Sat., June 9 - Bloomington Edge at West Michigan Ironmen, 4:15 p.m.
Week 17 -- Sat., June 16 - West Michigan Ironmen at Iowa Barnstormers, 5:05 p.m.